There is no “right way” to make Indian-style spiced tea (masala chai) flavored with ginger and cardamom. You can vary the ingredients based upon taste, and create your own unique formula for masala chai. I like to use milk from organic pasture-fed cows as the milk is sweet and naturally flavorful. I also believe that this tea does not taste the same without ginger that adds an aromatic, sharp and earthy taste to the tea. Some people like to add a strand or two of saffron to the tea for a rich, unique taste. You can also add a stick of cinnamon and a clove or two for a warmer, spicier flavor. Be careful to not over-boil the tea leaves, which imparts a bitter taste, and to not add too much ginger, which could make the tea very pungent (although I love an over-pungent tea that bites my throat). The idea is to make a cup of tea that you look forward to each morning or afternoon. Which means that you will sit down with a steaming cup in hand, perhaps with a little snack and a favorite read. The taking of tea becomes even more pleasurable when shared with a loved one. In a small saucepan, place the water to boil over medium to high heat on the stove. Meanwhile, pound the ginger and the cardamom using a mortar and pestle, and add the mixture to the water in the saucepan. When the water begins to boil, wait for a few seconds, and add the milk and bring to boil again. Watch to see that the tea does not spill over the pan; if the liquid begins to rise, reduce the flame. Then add the tea leaves, and continue to boil. Keep on the flame until the color turns to a rich caramel color, usually within one minute. 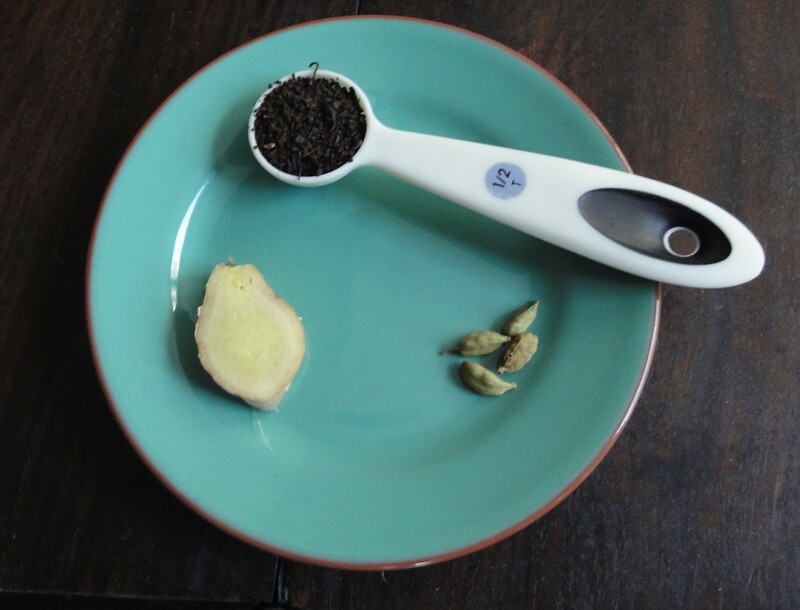 Remove, strain with a tea strainer into a cup. Add sugar to taste and stir. Serve immediately. This tea is best enjoyed hot.